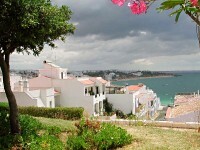 Albufeira is a charming city and a municipality at the southern coast of Portugal in the marvellous region of the Algarve. Once a peaceful fishing village, it is today one of the leading tourist resorts of the region, just a 40 minute drive away from the Faro airport. 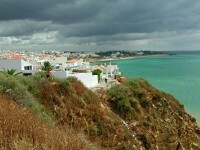 The name "Albufeira" is of Arabic origin and means in Arabic "lagoon". 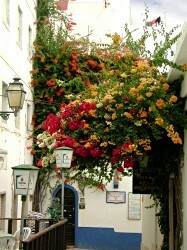 The architecture of the town ranges from typical narrow streets with white houses to very modern tourist developments. 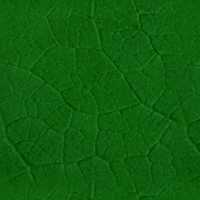 Very special is the traditional decoration of the older houses with colourful ceramic tiles and elaborate lattices from wrought iron at windows and balconies. Often even street signs are made from tiles, which have a long tradition, going back to the Moorish past. Located on a hill, embedded in lush subtropical vegetation and richly decorated with an abundance of colourful flowers, Albufeira is a lovely place to stay. At the steep coast there are beautiful hotels and romantic restaurants overlooking the sea with its broad, golden beaches. 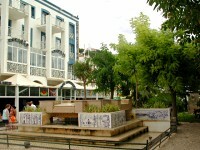 Once the sun sets, the centre of Albufeira comes alive with street markets, shops, bars and restaurants, which offer food for everyone's taste. Local culinary specialities are cataplana (steamed shellfish) and caldeira (fish stew) just as grilled sardines.